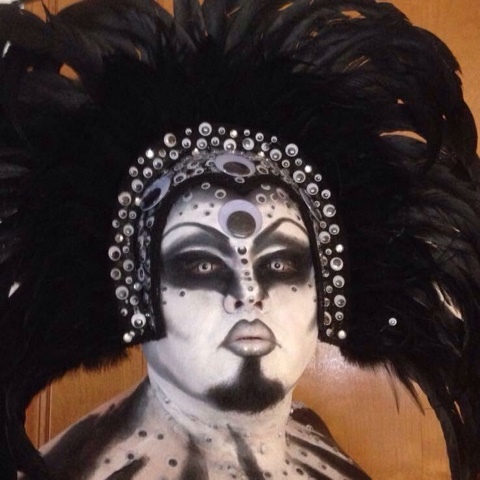 Drag is an art form that is loved by many around the world. With phenomenons like Rupaul's Drag Race, it has become quite mainstream over the years. It's no secret that drag artists are people who take inspiration from past hardships and heartache, and in this industry, we need to have a backbone. Dealing with the judgmental minds of others and still keeping it classy, Luci Furr-Matrix has proved to be a golden needle in the haystack of queens with an out of the box look and a genuine and loving attitude towards everyone she associates with. 1. Who is Luci Furr-Matrix? I feel like this is an exam I wasn’t prepared for…..30 minutes in, and I’m still trying to figure out the answer to this one….I suppose I would describe Luci as an ever-changing kaleidescope of night terrors, mixed with glitter & a touch of insanity. When I first started out as Luci, I was going for sort of a “Bubblicious Demon” look, but I’ve been evolving with every performance, and always try to push myself & be different each time. I rarely ever have a definite plan of who I’m going to be or what I’m going to look like, until I’m even done with the makeup. I let me mind make that decision based on what I’m feeling at the moment. No matter what I portray on stage, I’m the same off-stage as I am in my every day life. I do my best to be friendly, welcoming, & supportive of everyone. According to my friend, Edda Belle, I am “fun, fearless, and friendly - she is the wild party girl that everyone wants to be around!". 2. Where did you get your drag name from? 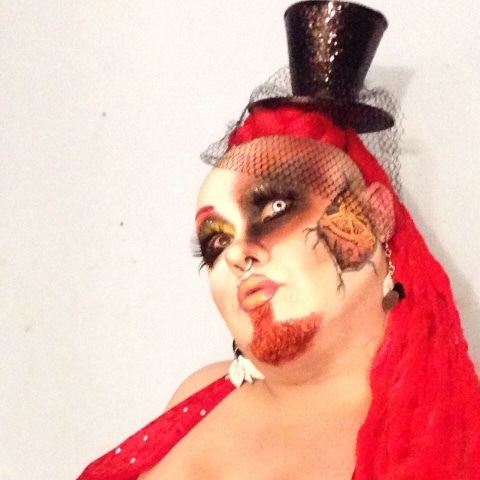 I had “quit” drag, but when I decided to come back for one more show, I had grown a goatee that I didn’t want to shave. Mainly because it takes 3 months to look halfway decent because of how slow it grows. So, when I told the show director I didn’t want to shave, he said “then don’t”. I felt the need for it to make sense as to why I had the goatee. I figured two things. 1) I wanted to reference the goatee in my name “fur”, and 2) the character needed to make sense…and the only name that seemed to make sense was “Lucifer” since the devil has a goatee. So, it started as Luci Furr. I then asked my long-time friend, Damian Matrix, if he would mind if I used the “Matrix” last name since my style fit his family’s style & I loved for what his family stood for. And that is where “Matrix” came in. 3. What does drag mean to you? 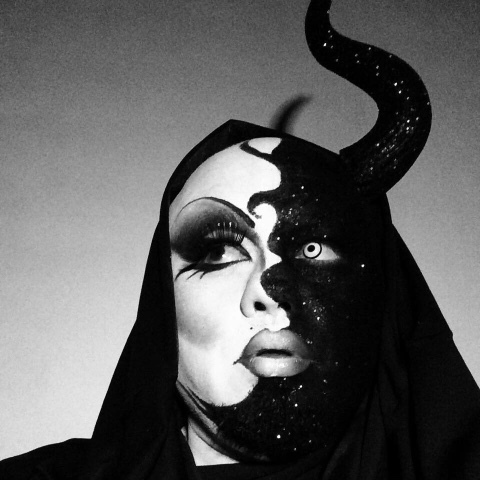 Drag gives me the opportunity to express myself artistically, in ways that I never knew possible. I get to share with everyone just how screwed up & twisted my mind is sometimes….and THEY LIKE IT?! Drag also helps me stay young at heart. It’s like I get to do all the things I love at once. I get to play, dance, sing, do arts & crafts, make costumes, act, and just be a big kid. It has provided me with the opportunity to meet amazing people, and it also gives me an opportunity to be a positive influence in the community. It has saved me from depression many times, and I don’t know where I would be emotionally without it. 4. 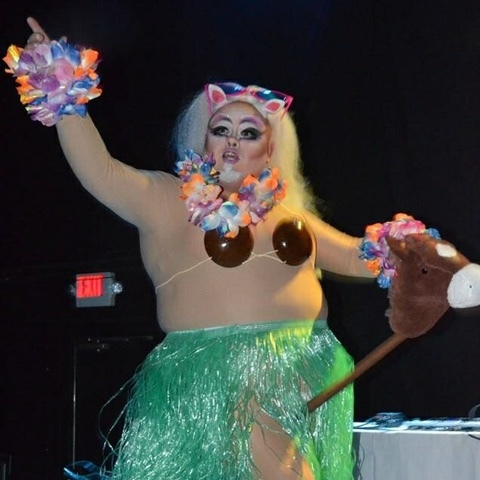 Favorite thing about drag? The endless possibilities of creativity and expression. I don’t limit myself to a gender. I feel very fluid, and free to be whatever I feel like. It’s like being in a trippy dream & having complete control. 5. Least favorite thing about drag? HEEEEEEELLLLLLSSSSSS! OMG!!!! Whoever decided that drag queens should wear high heels, should be tarred & feathered, and hung up in the town square, and be repeatedly beaten for days! Besides the pain, the damage that they have done to my feet is horrible. I haven’t been able to feel my toes for over 10 years because of the nerve damage from heels. F**K WHAT YA’ HEARD!!!! BUY FLATS!!!!! 6. What is something not many people know about you? I actually started drag as “Beverly Hills” in 2000. I was a pageant/fish queen for 13 years while I lived in Oklahoma. I was Ms Gay Oklahoma USofA @ Large 2012, & also did very well at nationals that year. I thought I would never do drag again, so I retired as Beverly Hills before I moved to Vermont, and Luci was “born". 7. When and why did you begin doing drag and how have you evolved into who you are as a performer today? I began doing drag on October 31, 2000 in Oklahoma City. I knew I always wanted to try it, but never thought I would actually do it. 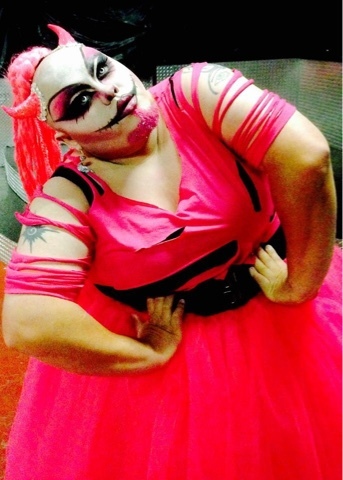 Well, it was Halloween, and I decided that I would go out in drag. There was an open-talent night that night at the club, so I decided to perform. It was supposed to be a one-time thing, but that clearly was not the outcome. I performed and competed in pageants from 2000-2007, when I could. I had a partner during that time that did everything in his power to make sure I knew he didn’t approve of me being a queen, even though he was one himself. I started off night one, basically alone in the clubs. I didn’t have any close queen friends at all. I continued to perform because 1) he tried to tell me I couldn’t, and it’s in my nature to not people tell me what I can & can’t do, & 2) I LOVED IT!!!! I quit in the summer of 2007, and then came back in 2011 after I met my husband & he encouraged me to perform again, after he saw how excited I got just watching RPDR the first season. I came back at the end of 2011 with a goal I had for years, of becoming Ms Oklahoma USofA @ Large, and I won in 2012. I then moved to Vermont in 2014, thinking I would never perform again since there are no gay bars, and gave up drag again. Then I was asked to perform at VT pride that fall & came up with the person of Luci Furr. I took all of the experience I had with makeup, costume making, & performance, and created a new persona that broke all the typical drag rules. Everything that I had been taught wasn’t drag, became my style. The change completely opened my eyes artistically. I don’t feel like I have to play by rules anymore. I can be whatever I want to be, and I feel that people get me. 8. How do you deal with judgements from other people when they judge you based on your out of the box aesthetic? At first it hurt me. It’s hard to be judged. I don’t have a thick skin at all, and I want people to like me, but not everyone is going to like me. And I can’t change that. I started off by defending myself, but I quickly got to the point where I wasn’t going to get all hurt & defend myself for my artistic choices every time someone didn’t agree with my aesthetic. At the end of the day, I have to be happy with who I am as an artist. And those people who judge me based only on my aesthetic, clearly are not a big enough influence in my life for me to give two shits. Those people are not my friends & family, and if that’s all they see is my artistic expression on the outside, it’s their loss. I’ve been that queen that played by the rules and tried to be what everyone thought I should be for way too many years. Screw that. I’m having so much more fun now. 9. After what happened with Queens of the Week, do you plan on starting your own YouTube? I do have my personal youtube channel, and I REALLY need to get more videos together to put on there. I was going to jump right back in to it, but I got delayed with work, and taking over a huge event here in Vermont each month. Now that I’m now focusing all my energy on being an artist, and performing is now my career, I need to jump back in with both feet & do everything I can to promote myself. I do have several ideas for ideas on my personal youtube channel, and I’m going to be posting things VERY SOON! I have been writing some music that I plan to get on there very soon, as well. 10. Where do you take inspiration from? I take inspiration from things that aren’t considered pretty or beautiful. I like to look at things that are disturbing, creepy, unconventional or just ordinary, and try to figure out how to make them fabulous. I love working with objects that most queens wouldn’t even consider using to make costumes & create looks. I do a HUGE amount of shopping for drag at the $1 store. Give me an object to incorporate in to a look & I will make it work. 11. Do you have anyone that you look up to as an inspiration? My biggest inspiration in the drag community is most definitely my drag mother, Mia Adams. She has always believed in me & supported me. When I had no friends, she made sure I kept going & performing. She took me with her all over several states, giving me the opportunity to perform in new venues, and meet new people. She truly cares for her drag family, and is so supportive of all of us….all 14,236,447 of us. As far as an inspiration for my current persona & aesthetic, that would be Damian Matrix. If you don’t know who he is….LOOK HIM UP!!!! He is an amazing drag king, former Mister USofA MI, and one of the sweetest people and best friends you could ever have. 12. What would you say is your biggest accomplishment? Not giving up drag. Even though I’ve tried twice now, and had many years where I didn’t fit in with any of the cliques, standing at the back of the club by myself, I kept going. Now I’m in a place where I have a much bigger following than I’ve ever had, and I’ve made so many great friends & created a drag family I can be proud of. 13. If you could change one thing about the world, what would it be and why? This is going to sound so cliche, but honestly…..world peace. I am honestly one of those people that wants everyone to get along. I am a true hippie at heart. I want everyone to love, respect, and appreciate each other, and not be divided by our differences. 14. What should people expect when they come to your shows? They shouldn’t expect anything, but prepared for everything! I am all over the place, and you never know what I’m going to look like or what I’m going to do. I typically LOVE high energy dancing, but I’m almost 36 years old & not exactly petite…so I feel it for daaaaayyyyss afterwards. I have been getting more in to comedy, singing, exploring my acting side. If I’m putting on a show, I promise I’m giving it 100%. 15. Where can people go to see you live? I am the producer & show host for First Friday at Higher Ground in South Burlington, VT. That is held the first Friday of each month, and is a show & huge dance party. I also perform the 3rd Saturday of the month at The Local in Rutland, VT. That show is at midnight. On occasion, I get to Albany to perform at Rocks or Waterworks Pub. Now that I am focussing 100% on being an artist, i am most definitely looking for bookings!!! !